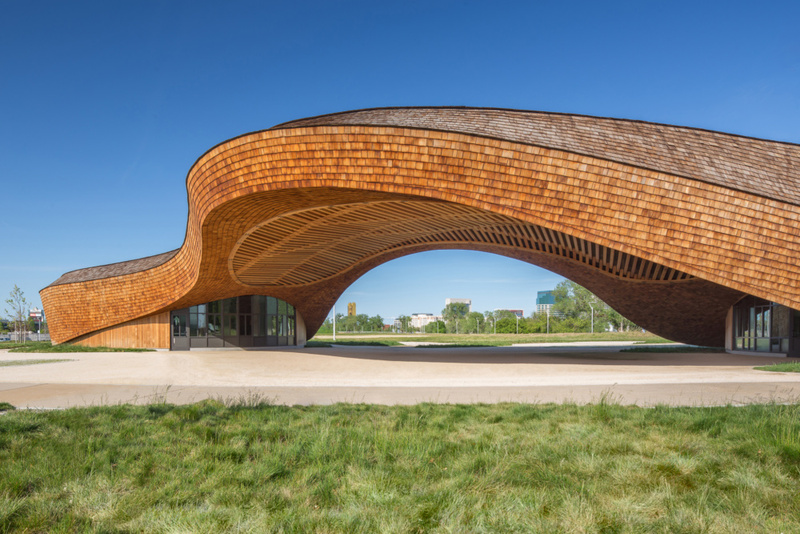 The Barn, designed by New York–based landscape architecture practice !melk, is a parametrically-designed wooden canopy with a restaurant and beer hall that opened in 2017. Located in the city of West Sacramento, the 9,100-square-foot project is the lynchpin of the larger 178-acre Bridge District, a mixed-use project with a planned population of 9,000 residents developed by Fulcrum Property. The undulating building rises from two “pods” occupying 900 square feet and 2,300 square feet respectively. Each pod sits atop a three-foot-thick concrete foundation that extends six feet outward from the circular glass curtain wall. A colonnade of concrete-filled, 14-foot-tall steel structural sections ring each pod, with each column strategically spaced to support the 16-ton wooden canopy above. Rising up to 20 feet from these two separate concrete-and-steel structural foundations is the double-cantilevered superstructure built of glue-laminated timber supplied by Oregon’s Wood Tech Services. According to !melk director Ian Hampson, a system of custom-designed steel “buckets,” timber rivet, and cross braces, are used “to tie together the intersections of the glulam beams and help to brace for lateral load and torquing. Hampson noted that the bucket plates both bear and rest on the glulam trusses depending on their location, and “allow for the attachment of a structural lattice, which makes each glulam truss function similar to the trestle of a bridge.” The secondary system, protruding from the superstructure’s glulam trusses and brackets, is composed of standard 4 x 4 inch and 6 x 6 inch wood beams that are topped with nearly inch-thick plywood sheets insulated with synthetic polymer roofing. Over 7,000 Class A cedar shingles, produced by Sacramento’s Gudgel-Yancey Roofing, cascade across the roofline, soffits, and towards the base of each podium. Since only a third of the overall footprint is occupiable space—an preexisting access route to the River Walk Trail runs through it—the design team envisaged The Barn as a public realm overlooking the Sacremento River and the downtown area. To shield any public gathering or lingering pedestrians from the Northern California sun, !melk employed parametric design to understand the impact of orientation and massing on overall shading, leading to the structure's unique oblong canopy. The underbelly of the canopy is defined by the exposed grillage of the secondary system's wood beams and soffits composed of the same Class A Cedar shingles. Exposing the truss system above, the grillage facilitates natural ventilation to the enclosed pods, and space for lighting features visible from across the Sacramento River. 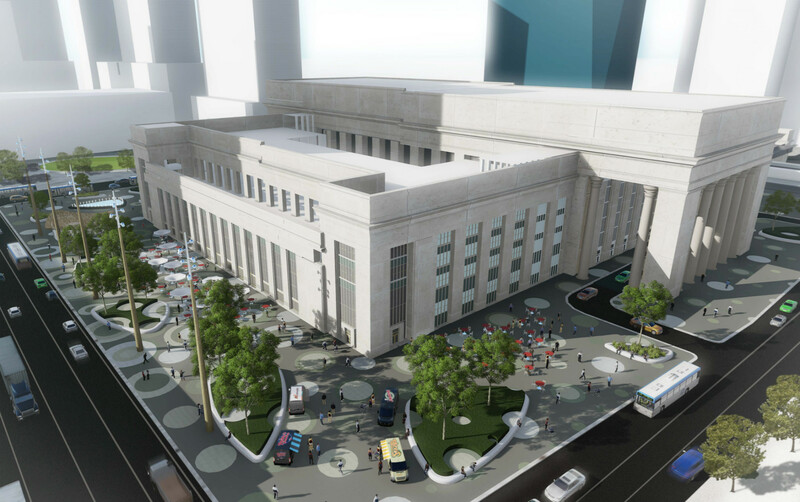 In conjunction with designers FXFOWLE, !melk, and Arup, Amtrak announced last week that it had chosen a final preferred concept for the plaza surrounding Philadelphia’s 30th Street Station. In the 107-page proposal, Amtrak called the area around the station a “sea of driveways,” and laid out steps the company was taking to modernize the transportation hub. Following up on an earlier call for input that Amtrak had put out in July, the final proposal comes after months of town hall meetings with Philadelphia residents. The new 30th Street Station will anchor the $6.5 billion 30th Street Station District Plan, an 18-million-square-foot, 35-year redevelopment of University City, the riverfront neighborhood surrounding Drexel, the University of Pennsylvania, Penn Medicine, and several other higher education institutions. 30th Street Station itself is only one piece of the puzzle, with other teams planning concurrent schemes for separate parcels, including SHoP Architects' and Netherlands-based landscape architects West 8’s Schuylkill Yards project. With an estimated 11 million riders passing through every year, and with Amtrak expecting that number to double by the time the 30th Street Station District Plan wraps up, any tweaks to the current station have to accommodate that increase. Besides serving Amtrak trains, 30th Street Station is the heart of Philadelphia’s regional SEPTA rail, and the new proposal better integrates the two disparate systems. A new ground-level entryway to the West Underground Concourse on the plaza was revealed, creating an underground connection to the SEPTA subway and trolley station. One of the biggest concerns that Amtrak has tried to address is how isolated the station is from the street. While 40 percent of the surveyed area around the station was classified as pedestrian-friendly, not all of it is connected to anything else or intuitive to navigate. Creating several pedestrian-only zones, the new proposal calls for the installation of rounded benches, planters and fountains designed to subtly delineate between plaza and parking lot. The west portico and southwest section of the plaza will also be converted into car-free green spaces. One minor change that should make a huge difference in the traffic patterns around the station is the creation of a distinct taxi pick-up zone at the east portico near the train platforms, and a drop-off zone on the west side. A 220-unit bike station will also be coming to the site, complete with lockers and bicycle rentals. Amtrak is currently searching for a “master developer” to actualize their proposal, with construction slated to begin in 2020 and finish sometime between 2025 and 2030. Read the full proposal here. Philadelphians: How should architects revamp 30th Street Station? As part of Philadelphia’s massive downtown redevelopment efforts, new plans were released on Tuesday for an integrated civic space surrounding 30th Street Station—the third-busiest Amtrak station in the country—by a design team including FXFOWLE, !melk, and ARUP. Over the next three decades, the station’s traffic is expected to double, according to a marketing brochure for the overall project, bringing renewed interest to the surrounding business district dubbed University City. 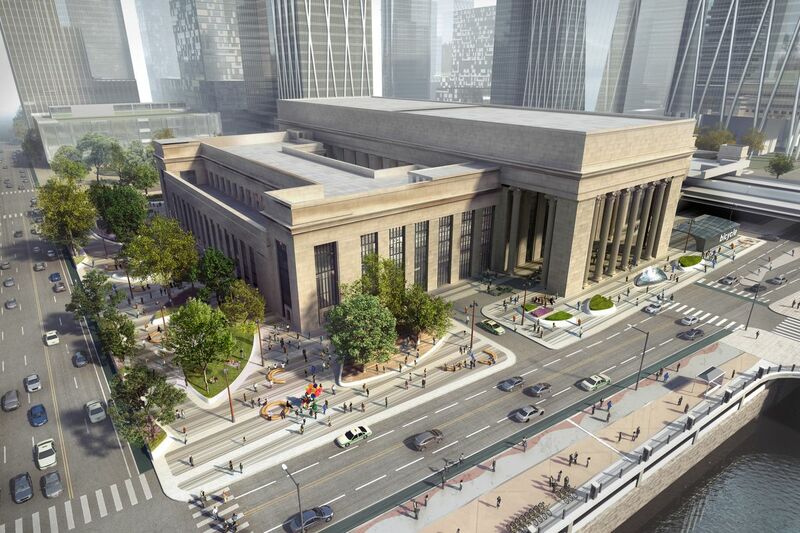 This 30th Street Station Plaza revamp is part of a wider, $6.5 billion 30th Street Station District Plan being led by Amtrak in partnership with Brandywine Realty Trust, Drexel University, PennDOT and SEPTA. Back in 2016, Skidmore, Owings & Merrill (SOM), in association with WSP | Parsons Brinckerhoff, OLIN, and HR&A Advisors, completed the initial design of the District Plan. In parallel, SHoP and West 8 have been working with Drexel and Brandywine on the Schuylkill Yards project, a 14-acre redevelopment which makes way for a 627,000-square-foot office tower as well as the redesign of public commons and arterials that tie together the district’s core: Market Street, J.F.K. Boulevard, and Drexel Square. Station Plaza, with its team of FXFOWLE, !melk, and ARUP, is one of several other early-phase District Plan projects advancing simultaneously. While 30th Street Station is currently surrounded by a closed ring of parking lots and concrete infrastructure, FXFOWLE and partners are looking to install a public plaza encircling the building. 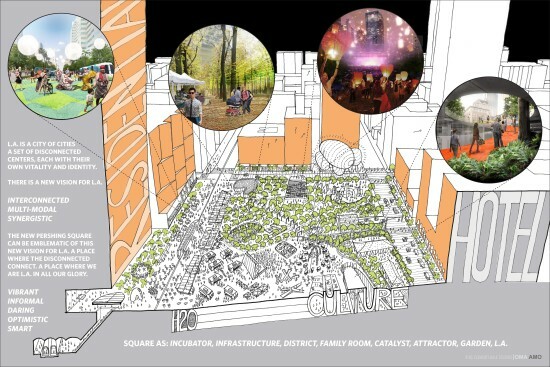 Their plan incorporates raised planters, pedestrian byways, seating areas, a public pavilion, and a food truck area. Pavers in the shape of concentric dots correspond to below-ground train routes and mirror the circular fountains and skylights incorporated into surrounding green space. According to the plan, the taxi and automotive area—which utilizes about 50% of the space at present—will be relocated to a transportation zone at one side of the station, opening up the decongested space to foot circulation and flexible programming. In addition to increased pedestrian traffic, this move will also allow room for a new underground entrance at the West Portico; the entrance is an unbuilt feature of the station’s original 1934 plans. The plan, in its entirety, is designed to decongest the area around the station and reinvigorate a historic railway, connecting it to other developments in the comprehensive plan and the adjacent Schuylkill River. Amtrak and the project’s team have opened up the renderings (viewable here) for public comment via an online survey (accessible here). Garnering opinions from commuters, visitors and locals alike, the survey will be open until 8 pm on Wednesday, July 26, 2017.